Increase your company’s sales, closing rate and reduce overhead by automating. Free up your sales force from repetitive routines, to do what truly matters- Sell! 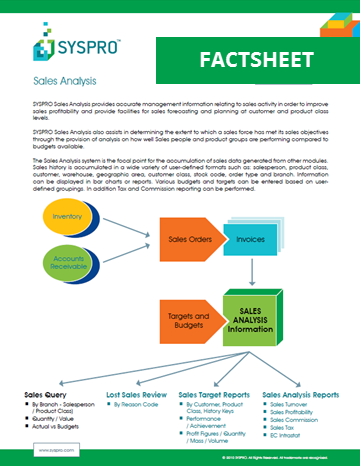 SYSPRO Sales Analysis provides accurate management information relating to sales activity in order to improve sales profitability and provide facilities for sales forecasting and planning at customer and product class levels. Customized sales force automation systems that align to your precise industry and business methodology. Unique solutions configured to fit precisely with your needs. Help increase win rates and shorten sales cycles. Get the free fact sheet now by completing the form. Get the FREE Fact Sheet Now!